This article is about the town in northern Warwickshire. For the village in southern Warwickshire, see Atherstone-on-Stour. For other uses, see Atherstone (disambiguation). 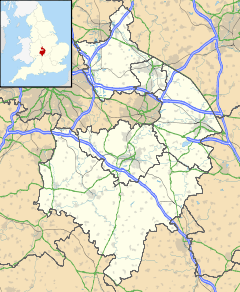 Atherstone /ˈæðərstən/ is a town and civil parish in the English county of Warwickshire. Located in the far north of the county, Atherstone forms part of the border with Leicestershire along the A5 national route, and is only 4 miles from Staffordshire. It lies between the larger towns of Tamworth and Nuneaton and contains the administrative offices of North Warwickshire Borough Council. At the 2011 census the population of the civil parish of Atherstone was 8,670. The population of the larger urban area which includes the adjoining village of Mancetter was 10,573. Atherstone has a long history dating back to Roman times. An important defended Roman settlement named Manduessedum existed at Mancetter near the site of modern-day Atherstone, and the Roman road, the Watling Street (most of which later became part of the A5) ran through the town. It is believed by some historians that the rebel Queen of the Britons, Boudica was defeated at the Battle of Watling Street by the Romans in her final battle near Manduessedum. After this, St. Mary's Chapel seems to have experienced something of a revival. Its square tower being rebuilt in the fashionable "Gothic" style in 1782. This drastic alteration probably aroused some controversy. although the fine architectural drawing of the chapel made by Mr. Schnebbelie in 1790 prompted Nichols to assert that "the new tower provides a good effect". St Mary's was further redesigned in 1849 by Thomas Henry Wyatt and David Brandon. It is said that the Battle of Bosworth actually took place in the fields of Merevale above Atherstone. Certainly reparation was made to Atherstone after the battle and not to Market Bosworth. Local legend is that they stayed at The Three Tuns in Long Street. In Tudor times, Atherstone was a thriving commercial centre for weaving and clothmaking. The town's favourable location laid out as a long ‘ribbon development’ along Watling Street, ensured its growth as a market town. While it remained an agricultural settlement in medieval times, attempts were made to encourage merchants and traders through the creation of burgage plots, a type of land tenure that provided them with special privileges. A manuscript discovered by Marjorie Morgan among the muniments of Cambridge's King's College (Ms. C9), refers to the creation of nine new burgage strips from land belonging to seven of the tenants in Atherstone vill. The surviving inventories from 16th century Mancetter provide a fascinating glimpse into Atherstone's Elizabethan merchants and traders, before the town was economically overshadowed by the bustling cities of Coventry and Birmingham. They show Atherstone at this time as a typical Midlands market town, taking full advantage of its location and agricultural setting. Atherstone was once an important hatting town, and became well known for its felt hats. The industry began in the 17th century and at its height there were seven firms employing 3,000 people. Due to cheap imports and a decline in the wearing of hats, the trade had largely died out by the 1970s with just three companies remaining, Denham & Hargrave Ltd, Vero & Everitt Ltd and Wilson & Stafford Ltd. The production of felt hats in the town ceased altogether with the closure of the Wilson & Stafford factory in 1999. As of 2018 the factory has received the go-ahead to be redeveloped into canalside residential apartments. Atherstone is part of the parliamentary constituency of North Warwickshire, with the current MP for the area being Conservative's Craig Tracey. The local authority is North Warwickshire Borough Council, which, since May 2015, has been under Conservative control. The town is situated 6 mi (9.7 km) northwest of Nuneaton, 9.5 mi (15.3 km) southeast of Tamworth and 15 mi (24 km) north of the nearest major city, Coventry. Atherstone is close to the River Anker which forms the boundary between Warwickshire and Leicestershire. Witherley village is on the opposite bank of the river in Leicestershire, whilst the village of Mancetter is contiguous with Atherstone to the southeast. Other nearby villages include Sheepy Magna, Ratcliffe Culey, Fenny Drayton, Grendon, Dordon, Baxterley and Baddesley Ensor. Its co-ordinates are 52°35′00″N 01°31′00″W﻿ / ﻿52.58333°N 1.51667°W﻿ / 52.58333; -1.51667 (52.5833, -1.5167)1. Atherstone is on the main A5 national route and close to the M42 motorway. The Coventry Canal and a series of eleven locks runs through the town, as does the West Coast Main Line railway. Atherstone has its railway station on this line, with an hourly service 7 days a week to both London and Crewe via Stafford and Stoke-on-Trent. The current level of service was introduced in 2008, and is a big improvement on the service two decades earlier there were simply 5 trains a day, just going between Stafford and Rugby. The historic station building, built in 1847, was under threat of demolition in the early 1980s. Thanks to a local group, the Railway and Steam Traction Society, listed status was obtained, with the building celebrating its 150th anniversary in 1997. Building work won a special Ian Allan conservation award. As of 2008, the railway station building is occupied by a local veterinary practice. The major football team in the town is Atherstone Town, known as 'the Adders'.This is after the tradition which has Atherstone being a corruption of the name "Adders - stone". Their ground is located on Sheepy Road. Atherstone's team started out as Atherstone Town Football Club in 1887 but folded in 1979, from 1979 to 2003 Atherstone's football team was known as Atherstone United Football Club but folded yet again mid-season in 2003. The team then reverted to the previous name Atherstone Town Football Club. The major rugby union team is Atherstone Rugby Football Club who play in the Warwickshire Two League. Their ground is at Ratcliffe Road. Atherstone Leisure Complex is at the north end of Long Street and consists of a swimming pool and gym. Atherstone Memorial Hall is also part of the leisure complex. The ball played in the 813th Atherstone Ball game Shrove Tuesday 21 February 2012. The game is a complete free-for-all played along Watling Street (the old Roman road) at the point where it forms the main street of Atherstone town. The ball is decorated with red, white and blue ribbons that are exchanged for money by who ever is able to obtain one and is made of thick leather to make it too heavy to kick far. The match starts at 3:00pm when the ball is thrown from the window of Barclays Bank and continues until about 5:00pm. However the ball may legitimately be deflated or hidden after 4:30pm. There are no teams and no goals, though in the last century the match was played between a team from Warwickshire and one from Leicestershire. There is only one rule: players are not allowed to kill one another. Whoever is able to hang onto the ball at the end of the game not only wins the game but is allowed to keep the ball as well. This Shrove Tuesday ball game has been held annually since the early 12th century and is one of Atherstone's claims to fame. The origin of the game, in the reign of King John, is thought to have been a "Match of Gold that was played between the Warwickshire Lads and the Leicestershire Lads on Shrove Tuesday". The 'ball' used is specially made each year and is 'thrown out' by a prominent sporting or show business personality. Shop windows are boarded-up and traffic is diverted on the afternoon whilst the game, in which hundreds of people take part, progresses along the town's main streets. Atherstone has strong naval connections. Three Royal Navy ships have been named HMS Atherstone for the town: Commissioned in 1916, 1939, and most recently, 1985. Jack Barnes (1908–2008) an English pro footballer, also played for Atherstone Town F.C. Frank Upton (1934–2011) an English professional football player and manager. Steve Webster (born 1975) an English professional golfer. ^ "ATHERSTONE Parish in West Midlands". City Population. Retrieved 23 January 2019. ^ "ATHERSTONE in Warwickshire (West Midlands) Built-up Area Subdivision". City Population. Retrieved 23 January 2019. ^ "1086 Domesday Book, Atherstone". Atherstone History. Archived from the original on 16 July 2010. ^ "Domain names | Domain name registration | 123-reg". Atherstone-online.co.uk. 11 March 2011. Archived from the original on 6 January 2009. Retrieved 11 November 2011. ^ Machin, Machin (10 August 2016). "500 jobs go as Atherstone warehouse closes". Tamworth Herald. Archived from the original on 11 August 2016. Retrieved 3 September 2016. ^ "Football Club History Database – Atherstone United". Fchd.info. Retrieved 17 July 2015. ^ "Atherstone Ball Game". 52.5767; -1.5438: Atherstone Ball Game. Retrieved 17 July 2015. Wikimedia Commons has media related to Atherstone.